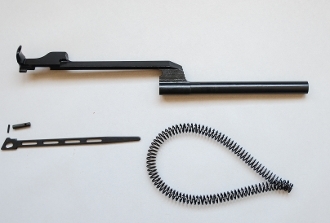 Includes a USGI HRA operating rod, USGI connector lock and pin, USGI spring guide and a TreelineM14 chrome silicon alloy operating spring. All the USGI parts are excellent, reparked. The op rod has been retabbed. If you look closely, the picture shows a WRA op rod - I'm using the same picture for all the manufacturers. You will get an HRA op rod.